27 August 2005: Even though Mexico’s 2002 to 2004 poverty-reduction trends are encouraging  particularly as far as rural poverty is concerned  the country still faces challenges such as reducing urban poverty, which has fallen into a rut of sorts, as well as the challenge of making its social protection system less regressive and more equitable so as to provide coverage for more of its poor. The indication came from the study Income Generation and Social Protection for the Poor, conducted by the World Bank at the request of the Mexican Government. The document, the second of a three-part programme study on poverty in Mexico, shows that in 2002 national and rural poverty levels recently reverted to the levels observed before the 1994  1995 crisis. According to the study, the factors that have contributed to rural poverty reduction include macroeconomic stability, an increase in public and private transfers, including remittances, and the diversification of income from non-agricultural activities, such as tourism and services. And yet, poverty rates in the urban sector have not improved. The urban poor work harder and earn less. Labour income is the main and often the only source of income for the urban poor. In Mexico, 57 per cent of the income of the poorest urban quintile comes from manual labour, which is higher than the Latin American average. As Gladys Lopez-Acevedo, a Senior Economist at the World Bank and author of the study put it: “Although wages have improved since 1996, the evidence shows that the urban poor still work more but earn less in 2003, compared with 1991. Over the last 15 months, labour market trends have not been encouraging, which is why one of the greatest challenges is to increase access to productive work opportunities for the poor." Another point made in the report is that since its inception in the 1940s, the Mexican social protection system has not made the necessary adjustments to tackle the risks faced by the poor. By not providing coverage for poorer households, the public social security institutions have failed to mitigate the persistent inequalities in the Mexican society, and as a result the vast majority of the poor have little means at their disposal to cope with risks. The study explains that Mexico has been investing less in social protection and in the social sectors in general, as a consequence of a reduced fiscal budget, which reflects the limited tax base and low fiscal revenues. Public resources to pursue enhancements and expansions of the poverty reduction programs and to increase social security coverage, particularly for the more vulnerable groups, are currently very limited. For this reason, a fiscal reform capable of expanding the budget is critical. While countries such as Brazil and Chile dedicate 16 and 19 percent of their GDP to social spending, Mexico allocates nearly 10 percent to the social sector; this is reflected in relatively low levels of per-capita social spending. By the same token, the greater part of spending on social protection does not reach the poor because of the system’s dual structure. Almost 90 per cent of spending on social protection is channelled through institutions geared towards providing health and pension services to workers in the public and private sector, resulting in the exclusion of informal workers. Currently, the IMSS (Mexican Social Security Institute) and the ISSSTE (Social Security Institute for Government Employees) together represent a major contingent liability, which is in the region of 82 percent of GDP. This structure poses a threat to maintaining and expanding other social spending programs that better target the poor. Built on an island in Lake Texoco in the early fourteenth century, the Aztec city of Tenochtitln was the largest city in the Americas. Rebuilt after the Spanish conquest, Mexico City served as the political, administrative and financial centre of a major part of the colonial empire of Spain. During the latter part of the nineteenth century, Mexico City modernized rapidly. The industrial development of the city was facilitated by the fact that it had the best infrastructure of the country, the largest consumer market, and a relatively well-trained labour force. Due to the devastation of the smallpox epidemic in 1520, Mexico City began its existence with only 30,000 people. Over the next four centuries population levels grew slowly until the spectacular growth of the twentieth century. 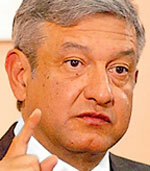 Migration was more important than natural increase in fueling the population growth in Mexico City. From a population of 1.6 million in 1940, it increased to 3.1 million in 1950, 5.4 million in 1960, 9.1 million in 1970, 13.9 million in 1980, and about 15.6 million in 1995. This rapid growth in Mexico City was the outcome of policies that greatly favoured the concentration of industrial production in Mexico City. Mexico City had access to electricity, oil and other power sources, the provision of water and drainage facilities, and was the focus of major road investment programmes. The most important industrial activities undertaken in the city include the manufacture of clothing, furniture and repairs, publishing activities, production of rubber, plastic and metal goods, as well as the assembly and repair of electrical goods. Most of this production was for the national and local markets rather than oriented towards global markets, as is now the case due to the North American Free Trade Agreement. 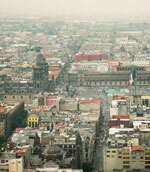 Urbanization has had a serious negative effect on the ecosystem of Mexico City. Though water supplies have increased to 300 liters per day per capita, the city lacks an efficient distribution system. Although 80% of the population have piped inside plumbing, residents in the peripheral areas cannot access the sewage network and a great percentage of waste-water remains untreated as it passes to the north for use as irrigation water. Pollution is undoubtedly the most serious problem in Mexico City. 2.6 million private automobiles in the city were estimated to be responsible for 50% of traffic congestion and produced about 80% of air pollution.